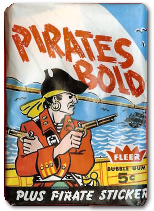 The only information I have ever seen on Herbert Matteson is from the 1961 FLEER trading card set "Pirates Bold". To date I have not found any information linking him as a descendant of Henry Matteson. But, since we do share the same Surname it is an interesting possibility. 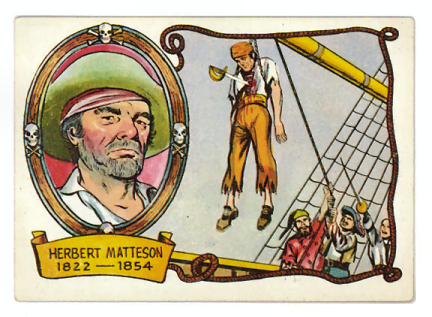 If you can provide any further information on Herbert Matteson - the pirate, please forward it to me so I can include it here. He won his first pirate captaincy by murder, then became a foe of all other pirates. Whenever he encountered a sea rover stronger than his own ship, he sought to capture it for himself. Finally, angered pirates united, attacked him near Maracaibo, Venezuela and left him hanging from his own yardarm! 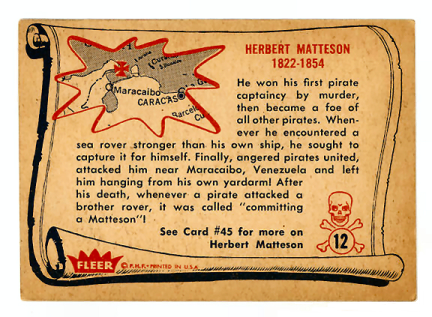 After his death whenever a pirate attacked a brother rover, it was called "committing a Matteson"! Matteson wanted to become head of a pirate federation, but in his way stood John Elroy with a force five times stronger. Under the guise of a friendly visit, Matteson and his crew came aboard off Puerto Rico. The unsuspecting Elroy found himself menaced by Matteson's pistol and cutlass, and ordered his men to surrender. Matteson executed every one of them, thus arousing the hatred of every pirate in the Caribbean.